For the month of February 2014, our friends at You Plus 2 & Beyond the Basics of Toddler Development are tackling the topic of parenting and play. They’ve asked notable bloggers, writers and parents to contribute their thoughts on why play can feel difficult, boring and challenging at times. You can follow along with the project here. Rachel is sharing some great play ideas with us today. Sometimes playing with our kids is hard. It can be monotonous or boring; we may feel too distracted or lacking the energy it takes to meet the play demands of our children. And yet it’s important and necessary to give them the attention they desperately crave, even if only for 10-15 minutes. It is in these times when you’re feeling uninspired to play that a little change of scenery or a small tweak to your normal surroundings can get your creative juices flowing and help you feel more excited about and engaged in play. Here are three of our favorite ways to transform ordinary everyday spaces into unique, fun and creative play places. Go Down Under. Most kids love small, confined spaces where they can sneak and hide, and what better place to do this than under a table. Throw a large blanket or sheet over the top so that it drapes down the sides or secure it to the dining chairs, and then encourage your kiddos to crawl under. This regular old space can immediately become a cave, a dungeon, a clubhouse or the secret meeting room in a princess castle. Bring pillows, stuffed animals, books and snacks under there and then squeeze in yourself. Let your child take the lead by simply asking “Where are we?” and let her imagination guide you. Tent Time. 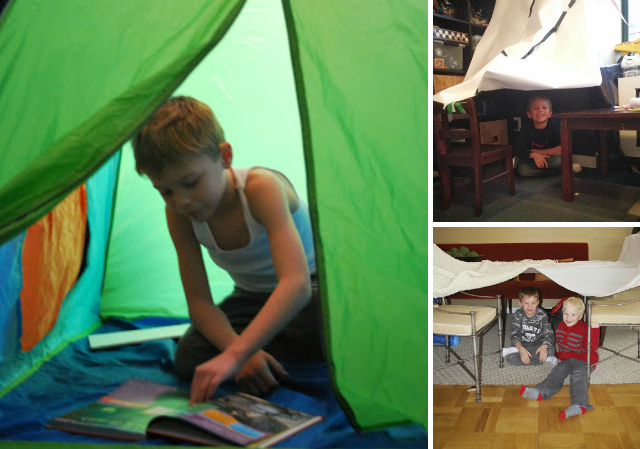 Another way to change a regular ol’ room into an inspiring place is to pitch a play tent and have your child bring his favorite game or toys inside. There are so many adorable themed pop-up tents for kids that you can find online or in your local toy store that are also collapsible and easy to store away. Even without a tent you can improvise and make one with butcher or wrapping paper. Find a corner where you can tape your paper up, anchor it to some chairs or shelves, and before you know it, you have created a cozy fort for your kids to play in. Throw in some dress-up clothes or other extra props, and within minutes, you and your kids will no doubt be engaged in a fantastical play scene. If you want something more permanent, you can try these play tents from The Land of Nod—what a fun way to create a magical space in your child’s room or playroom! Beds…Not Just for Sleeping. Another favorite space to inspire play is your child’s bed. Hang a canopy that drapes around her bed so she can close herself inside, or if your kids are in bunk beds, attach a sheet or a blanket from the top bunk to the bottom bunk so they can huddle together and play on the bottom in their “secret” place. Kids really seem to love being enclosed, so using a bed is a fun way to create a cozy, comfy place for play and transforms a regular functional space into something special. Amp up the fun factor in any of these ideas by shutting off the lights and giving your kids flashlights, headlamps, glow sticks or any other sort of glow-in-the-dark item. You will open up a whole new world of exciting, creative play scenarios. Even a beautifully staged and fully stocked playroom can become uninspiring every once in a while when it’s part of the normal “landscape” of your home. By thinking outside of the box to transform ordinary spaces for your child, you will not only feel a bit more inspired to play yourself, but you will also create a new world in which to connect and bond. Even if you can only join him in his new special spot for a few minutes, your efforts to take a plain, normal space and make it spectacular for your child will be so very appreciated. And who knows? You may reawaken your inner child while huddled inside a tent with a flashlight—play may not feel so dull after all. Rachel is the founder of You Plus 2 Parenting & Beyond the Basics of Toddler Development. She specializes in guiding expectant and new second time parents and parents of toddlers through the challenging years of early parenting. Thanks for these great tips, Rachel!